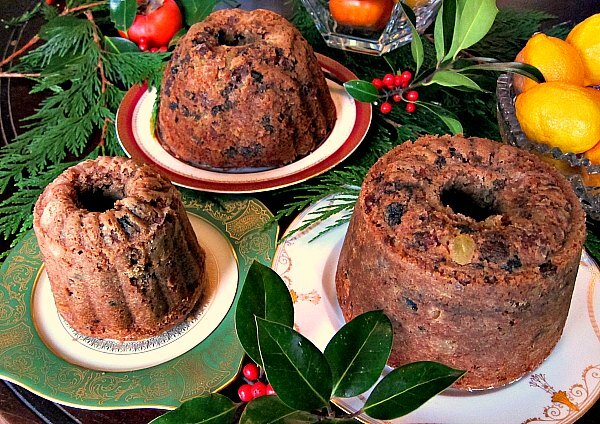 Home Recipes Free Range Fruitcake: Something to Cluck About! Free Range Fruitcake: Something to Cluck About! 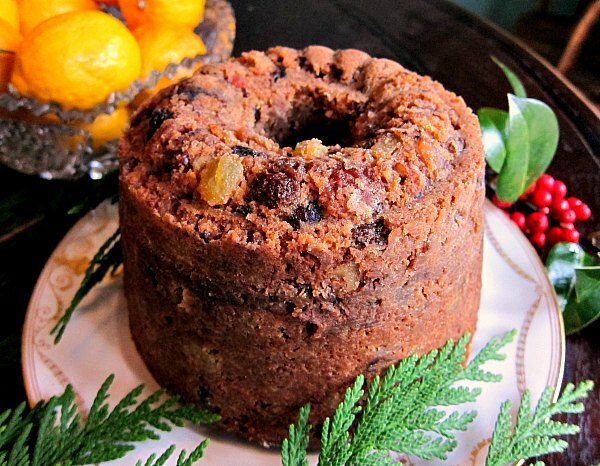 Behold an exceptional fruitcake, one that deserves a little respect. Oh, go ahead, start with your jokes, mock the baked good that moonlights as a doorstop, wrecking ball, and scapegoat for holiday angst. Get it out of your system fruitcake grinches, for I am here to redeem the reputation of this much maligned Christmas confection. Great fruit makes for a great fruitcake: dried apricots, cranberries, blueberries, golden raisins, homemade orange peel, and sour cherries. 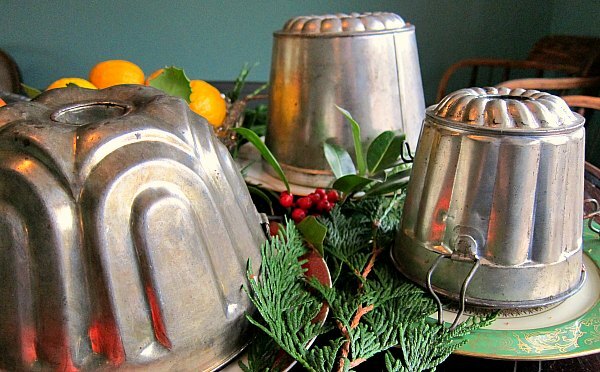 I’m a big fan of vintage baking pans, so I bake my fruitcake in these metal molds designed for steamed puddings. I have to admit the neon-bright candied fruit of old-school fruitcakes can be off-putting, but that’s an easy fix; indulge in the amazing variety of dried fruit available these days, usually found in the bulk section of a grocery store. 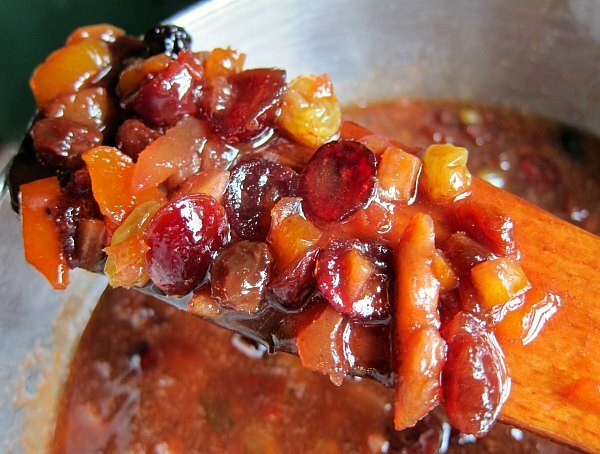 For me, that includes all or any combination of the following dried fruit: apricots, candied orange peel , golden raisins, currants, sour cherries, blueberries, figs, and crystallized ginger. When you bake with a lidded pudding tin, the cake tends to come out moister and denser. If you don’t have a lid, you can always cover the pan with foil. And leave off the lid should you like a dryer cake. I’d like to share a recipe, an updated version of this bejeweled baked good, a recipe festooned with the sweetmeats of summer and sopped up with a wee bit of worthy spirits. The recipe comes from one of my favorite celebrity chefs, Alton Brown, the no-nonsense science guy of cooking. Alton (oh yeah, we’re on a first name basis) calls it a free range fruitcake, no doubt because he takes what has become the sad standard and improves upon it ten-fold. His cake is moist, aromatic, spicy and chockablock with sweet treats to tease your tongue. Here’s the Recipe for Alton Brown’s Free Range Fruitcake. As fruitcake is known for the boozey company it keeps, I went local and substituted the rum with Idle Hour Whiskey from the Seattle Distillery which is located here on Vashon Island. It’s a smooth bourbon-remiscent spirit, that is tamed with just a nuance of honey. So let’s toast to our new year, your new love of a better fruitcake, and a plenty of idle hours to enjoy. Beautiful, architectural, and now I want cake. Hope you continue to heal & that the rest of your holiday is merry & bright & full of good things to eat. Thanks Anne, I just finished up an amazing loaf of panettone bread that my pal Karen baked. Mama Mia! Thank goodness for great Italian cooks and bakers. I’m on the mends and filling like a million bucks today. Well enough to tackle the house that I ransacked while ill for the last week. Great find! I doubled this recipe for Holiday cakes and they were a big hit especially for the folks who used to eat the fruitcake with all the colored fruit (yuck!) Now they’ll never go back! Barbara, I too doubled the recipe and I’m glad to report, like you, that it works beautifully, though there was barely an inch to spare at the top of the mixer bowl, and for a while I thought it may kill my KitchenAid mixer. I finished it off my hand stirring the batter. At long last, I don’t have to hide my love of fruitcake – even the doorstoppers, hesitate to add. This recipe reads well and your end results make me wish I could reach through the monitor screen and help myself to a wedge of fruity goodness. Mr. Brown is my favorite celebrity chef/food science guy; you’re a neck-and-neck-second. Time to visit the grocery and dig out my pudding crocks. Alright Martha! United we stand in gaining ground for the due respect of fruitcake. Happy New Year and thanks for the putting me in such good company. Tom, those tins are amazing. I have not seen anything like them before -just lovely. They make the cakes very special. I hope that you and your furry family had a lovely Christmas. Thank you Jacqui, Happy New Year to you and yours! I’m sorry you have been ill, Tom. I have been wondering where you’ve been! 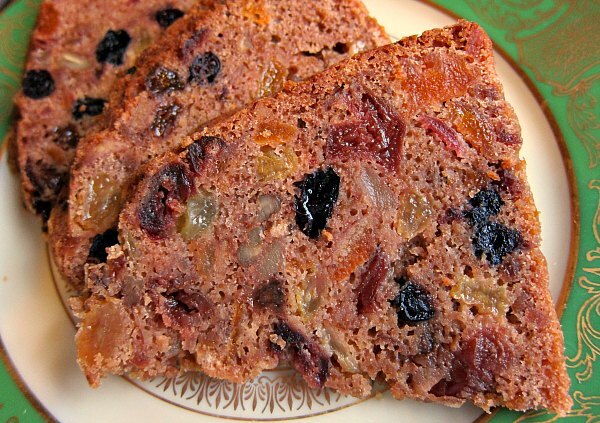 The fruitcakes look amazing–one of my favorite cakes. Have you read A CHRISTMAS MEMORY by Truman Capote? I am thinking of that story today brought on by your post! Lovely! Pam I was down for the count indeed. I sure love feeling well. 😉 Funny you should mention “A Christmas Memory” I love that short story. I always read it with a Southern accent in my head. What stunning fruitcakes and presentation! You have been very busy. Please do a post on all of your vintage molds sometime. And… have a Happy New Year! Truth be told Eileen, I was out sick for a while and these cakes were baked well before Christmas. Speaking of vintage molds, I sure love the ones you posted on your blog once, the ones with the triangular shape loaf pan–stunners! Happy New Year! Glad to hear that you are feeling well. Wondered if you were on vacation when you did not post for so long. Hope you , Boz and Gracie have a happy new year.